Details the effect of being a non-alcoholic person married to an end-stage alcoholic. Frustrations, trials, tribulation... and yet... there is comedy hidden in the insanity. This blog also provides useful insight and facts concerning the complexities of conflicting information. Kelsey Brown of Nova Recovery Center contacted me about doing a post on the roles family members often play in an alcoholic family. While there are a few things in this write-up that do not match my point of view, I like what Kelsey has written. Since it's a long write up, this post will be shown in a series of three separate posts. I won't confuse the issue by writing in between the posts. However, when the last one is published, I will write a post giving my feelings / differences with Kelsey's post. If addiction is ravaging your family and you, your child, or your sibling is playing the hero, there are a few actionable steps you can take to break the dysfunctional family roles and regain a healthy, balanced household despite the addict’s behavior. Talk about what is going on. Ignoring the addiction and trying to pretend nothing is wrong is probably the worst thing you could do in this situation. This approach will only cause confusion and a disconnect among your family members. Conversely, talking about the addict’s behavior and the addiction, in general, can unify your family and promote healthy communication. 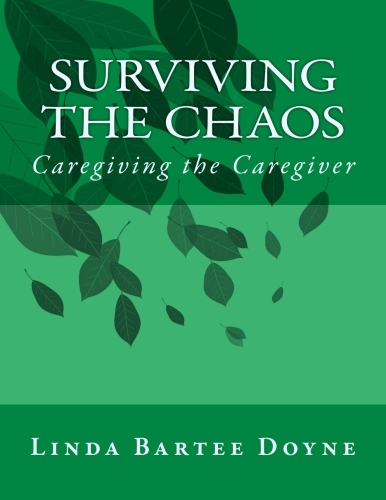 Identify the dysfunctional roles within your family and take ownership. Once some communication is established, it’s important that each member of your family identify the roles they see and actively participate in and take ownership of those attitudes, beliefs, and emotions. Admitting that you need help to modify these roles and behaviors is another big step in the right direction. Make amends with one another. If you’ve lied, cheated, stolen, or harmed one another, a difficult but necessary step in the healing process is to make amends. This simply means you do your best to right any wrongs and restore justice when possible. Agree to work together to help the addict get treatment. Instead of working against one another in these dysfunctional roles, use that energy to come to an agreement in which you will all work together to get the addict the help he or she needs. Whether that means planning and organizing a family intervention or researching treatment options to present to the addict, working together is much more effective than working against one another. Practice new, healthier behaviors and be patient with yourself and others. It will take time and effort to establish healthy roles within the family unit. Try to take one day at a time and be patient with one another through the transition. Much of this will have to be very intentional at first, but eventually, the communication and healthy behaviors will become more natural. Breaking dysfunctional survival roles in the midst of addiction is difficult, but family therapy is an extremely helpful tool that can help each member of the family heal from emotional wounds, address conflict, and learn how to communicate effectively in a healthy way. Kelsey Brown has always been an avid reader and writer. She received her Bachelor of Science degree in Journalism from Missouri State University and now lives in Austin, Texas with her husband, daughter, and labradoodle. She regularly researches and writes on topics related to the substance abuse treatment industry, including detox, rehab, sober living, and mental health issues. When she’s not writing, Kelsey prefers to spend her time outdoors, hiking, camping, and biking. There is a newly created page on this blog that is just for the alcoholic. I will NOT be posting on this page personally. If you have a story you would like to post on this page, please e-mail. I'm also looking for posts from rehab facilities or other people reaching out to alcoholics. Contact me at immortalalcoholic@gmail.com with details and contact information. FINANCIAL WORRIES? IRS TAX LIEN? Please call Gina Mewes… she can help by openly and honestly answering all your questions and you will feel relief. She will stop ALL levies and garnishments immediately. The IRS has many programs to reduce or eliminate your tax debt through the Fresh Start Program, unfortunately they DO NOT tell you or guide you through this process. Gina will be your biggest advocate, handle all communication and relieve your worry and stress. Let her battle the IRS for you. Don’t try to battle them alone. Gina’s values are simply – Instill Trust and Honesty; Share Knowledge; Work Extremely Hard; Be Meticulous; Encourage Excellence; and last but not least – Be Affordable. $9.99 Download your copy now! 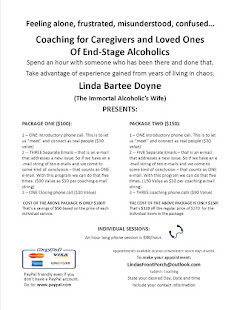 WORKBOOK FOR CARETAKERS OF END-STAGE ALCOHOLICS is an interactive workbook in PDF format. It is a download to your computer so that you can enter the information about your alcoholic's personal and family history, medical visits, lab reports, detox and rehab logs, and general information. Everything you wish you didn't need to know. I welcome your responses and feedback. Please feel free to leave comments on any of the posts or pages. http://www.nursepractioner.org/addiction-blogs I've been included in the Top 100 Blogs for Overcoming Addiction by this organization. For others who made the list visit their site. http://thriveinlife.ca/thrive Thrive In Life E-Magazine has published an article that I wrote from them. Check it out! http://alcoholism-about.com/b/2010/12/09/end-stage-alcoholism-lindas-immortal-alcoholic.htm I was featured on this website which provides everything you ever wanted to know about alcoholism and addiction. This is an excellent source for anyone dealing with alcoholism on all levels. http://www.hypercryptical.blogspot.com/ There is an interesting 2 part post concerning alcohol dementia. http://www.alcoholicdaze.blogspot.com/ The Contagious Disease is an excellent post with lively comments. Don't miss it. http://www.smartrecovery.org/ is a website and support group for all types of addictions and includes families and friends.